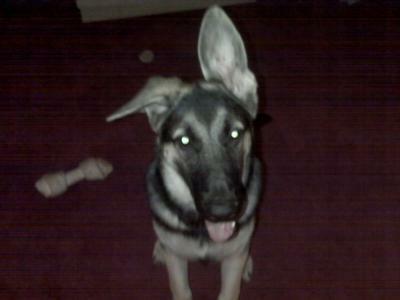 My GSD is 6 months old, still teething..His ears are still not up. They go up and down at different times. The tips are not soft, but they hang to the sides.Is there a chance they can still go up??? Could be that the pup needs extra calcium in their diet to compensate for growing bones and ear cartilage. Never hurts to give a vitamin/calcium supplement during the crucial growing age--up to 2 years old. Could also be behavioral. I have a mother, son and daughter. Mother and Son's ears are completely up, always, daughter, being the most submissive of the three could use some more confidence. Getting her away from the other two and out and socializing has made all the difference in the world. As she gets braver by herself the ears are perked right up. All Raven's teeth are in but not fully...Is this still considered teething?? Just say no to Velcro!!! Please don't experiment with just anything - you'll do more damage than good. Today, 12/01, his ears were up a lot of the time..They are back down again..I thought of using thin strips of Velcro on the inner sides of the ears to make a tepee.. I also heard the other day, if the dog is going to be a big boy, the ears take longer to stay up...Well, he is not done teething yet.. If your German Shepherd puppy is still teething it is very common for the ears to go up, down, flop here or there, etc during this process however time is running out on your babies ears standing on their own. I always suggest taping the ears if the need it, kind of like braces for crooked teeth. Sometimes the GSD puppy ears need a little help and this is where taping comes in. If they don't come up/stay up on their own after you tape them a few times then chances are high that they won't at this age but there are a lot worse things than downed ears. Love your German Shepherd puppy for its uniqueness whether its ears are up or down. This has no effect on its ability to learn, to train or to be a companion to you.